Who doesn’t love an excellent lunch during the work week? I am partial to Kohn’s Kosher Deli in Creve Coeur, MO. Even a goy like me can enjoy a hearty nosh from time to time. Besides their epic corned beef, I am partial to sweet kugel (essentially a bread pudding made with noodles) and kasha (some grains and pasta, with a little warm gravy). I can’t say I’m much of a knish guy, though. Still, my recent lunch there was amazing. 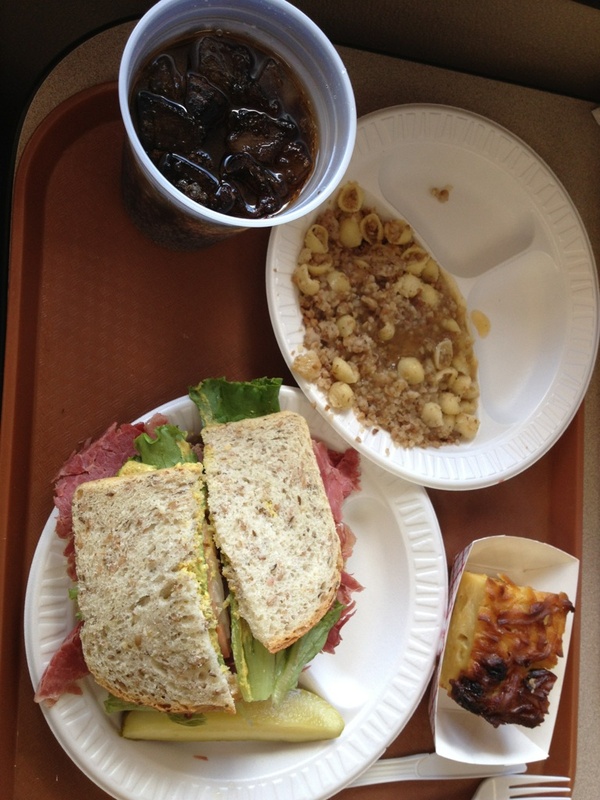 You need to realize how amazingly huge and succulent the corned beef sandwich was. Kohn’s claim to fame is purportedly their “killer” pastrami, but my strong Irish genetics tell me that their corned beef is wildly superior. I’m no schmuck and I’m not being shmaltzy, but try the corned beef already! Oy vey! Early on Sunday afternoon, I put the two 1 lb strips of kosher bison meat in an aluminum lasagna pan filled with 2 PBRs and a few sprigs of rosemary & some fresh basil, both from my garden, along with a bunch of whole peppercorns. 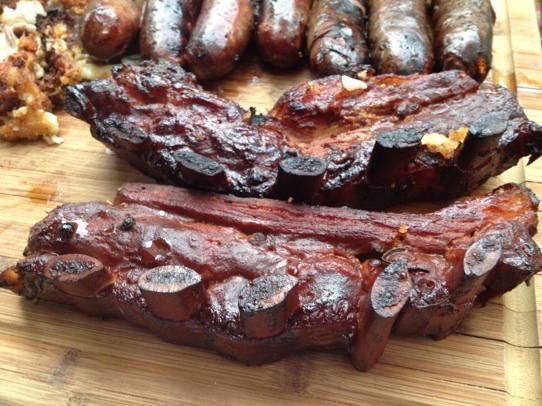 The whole set went over semi-direct heat on the Weber 22″ grill. Don’t kvetch. It will turn out okay. They certainly looked good at the 30 minute mark, when I gave them a turn. It’s really difficult for me to describe via this blog just how delectable this smelled. Woah, Nelly, do these smell good. Finally, after an hour braising, I pulled them. The short ribs went over indirect heat on the far side of the grill from the coals and I added a bunch of the Ozark Sugar Maple wood chunks to the fire. Though the wood was dry, it still produced an ample amount of smoke without burning. 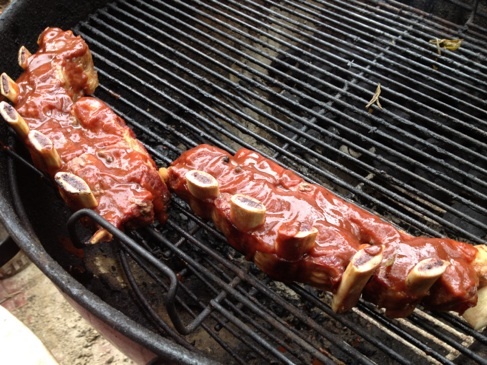 I handed out copious coatings of Jack Stack BBQ sauce and left it alone for about an hour. 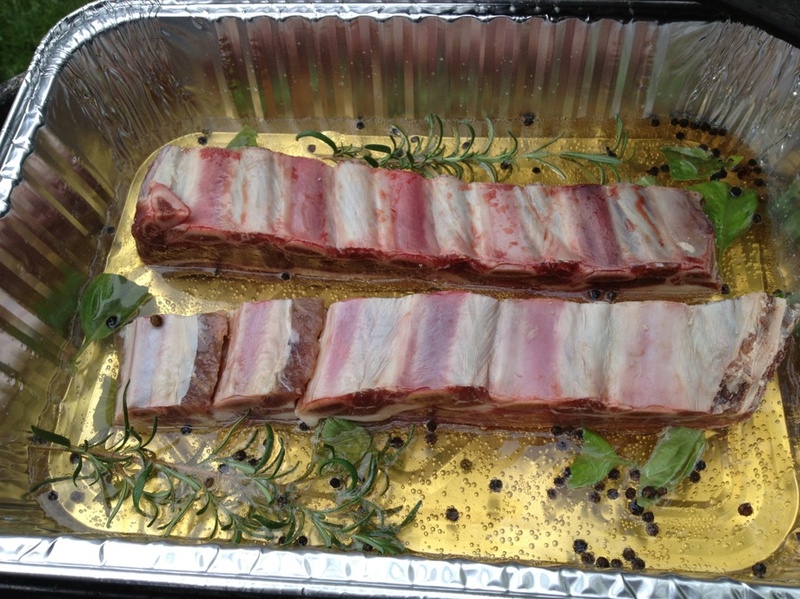 All of my internet pre-BBQ diligence said that you should treat bison the same as beef. What I would later learn (from sampling) was that I should have treated these like pork and wrapped them in foil to tenderize! Still, the one hour product looked amazing. 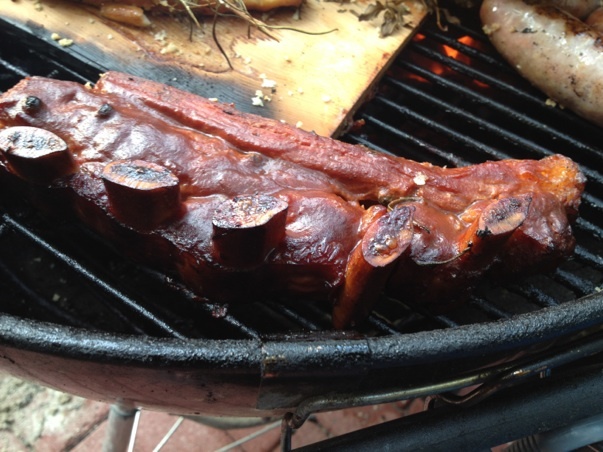 The final product was savory, sweet, smoky… everything was perfect except they weren’t very tender. I dare say they were a little tough! Dammit. Finished and ready for this goy’s belly. Oy vey! Disappointing though it may have been in the tenderness department, the short ribs were phenomenal on depth of flavor. They were super-easy to make. Next time, I will give them a foil wrap over semi-direct heat and let them tenderize with the sauce and maybe some liquid to finish them off. I don’t want them to be too tender such that they are mushy and the bones fall out, but there has to be some kind of bison happy medium. Kosher BBQ is a new avenue for me. (Technically, the bison was surrounded by non-kosher catfish and very non-kosher pork bratwurst, but who’s keeping score.) I will head back to Kohn’s soon to get some more bison… they sell bison brisket, by the way! 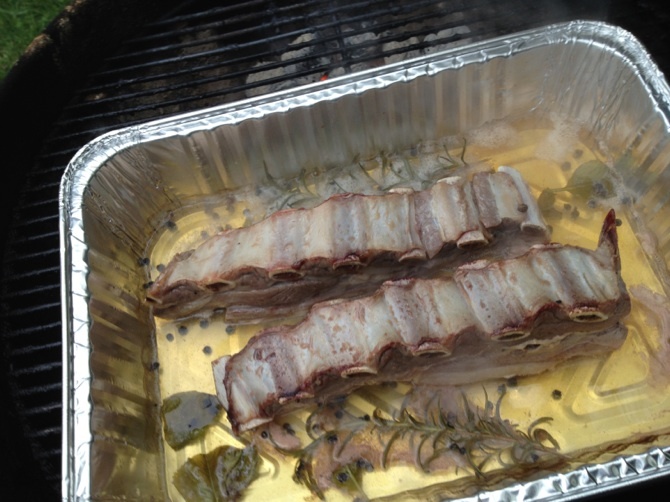 I like to do almost all game ribs (elk, bison, venison, etc) the same way I do pork: Dry rub, let cure overnight, start in foil over low-indirect heat, preferably in an enclosed smoker at around 225-275 degrees until about 3/4 done then remove the foil, and another light dusting of rub, and let finish… put sauce in a bowl on the table, not on the ribs… But that’s mainly a personal preference (or dislike) for BBQ sauce! 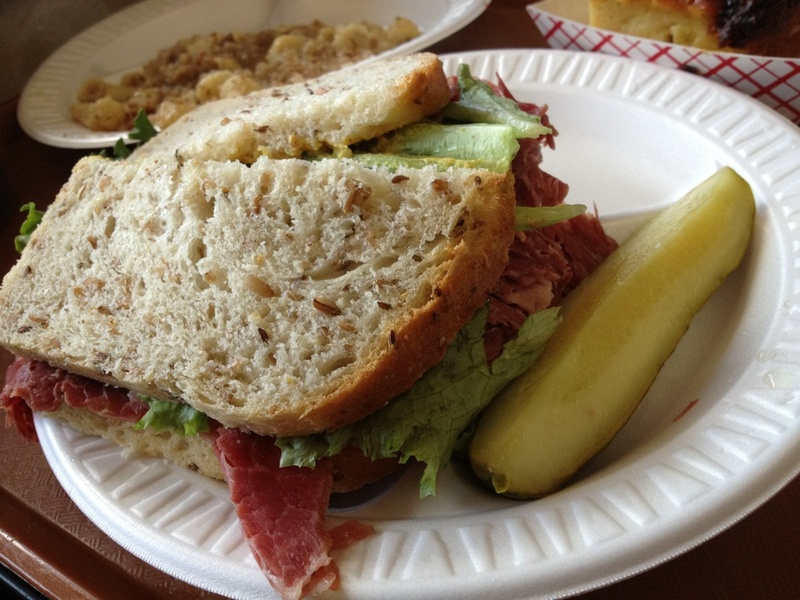 Great post, but now I want a Reuben, damn my Irish heritage!